Parks contribute to good health and improved quality of life. 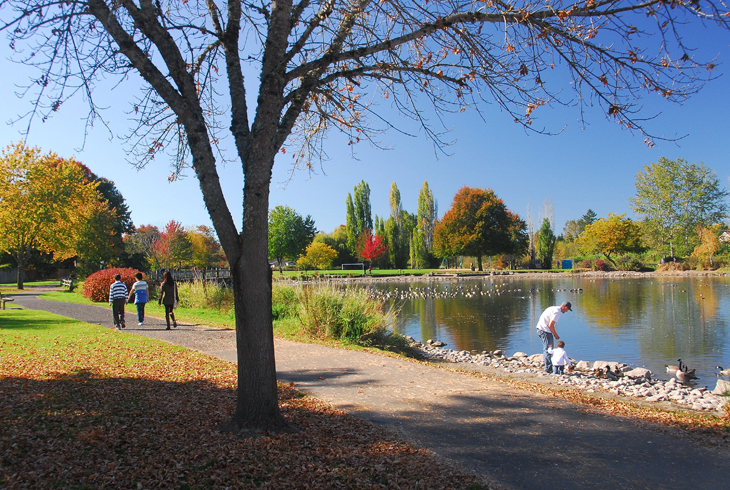 Put on your walking shoes and visit THPRD's great destinations, like Commonwealth Lake Park. We invite residents to gather, play, and explore. THPRD boasts more than 90 park sites with recreational amenities, 60 miles of hard- and soft-paved trails and more than 1,500 acres of natural area. Get an up-close look at forests, lakes, streams, birds and other wildlife! THPRD's parks are open year-round, dawn to dusk. They receive regular care from our park maintenance staff. Many sites host free events and educational activities, and some have picnic shelters that can be rented for private events. All 3,600 acres of THPRD properties, including our parks and trails, are smoke-free. Our Nature & Trails staff provides stewardship of the district's natural areas and oversees nature-based education programs and activities at the Tualatin Hills Nature Center and other sites. For questions about natural areas, trails, or environmental education programs, call 503-629-6350.